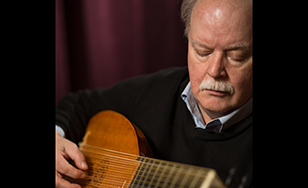 The public is invited to a faculty recital featuring Edward Martin playing the lute at 7:30 p.m. Saturday, April 2. "Music of France, Italy, and the Czech Lands" is free and open to the public, and takes place in the St. Scholastica Music Hall (Room 3625 of Tower Hall). The music is from the 16th and 17th centuries will include works for renaissance and baroque lutes. Martin will perform solo songs as well as duets with tenor vocalist and St. Scholastica faculty member William Bastian. The entire program will consist of pieces very seldom heard in modern performance, and will provide a glimpse into some of the most subtly beautiful music for renaissance and baroque lute. Martin is an adjunct music instructor at St. Scholastica. He has been playing the lute for nearly 40 years. The lute is a stringed instrument with a neck and a deep, round back, and is used in a variety of music from the Medieval to the late Baroque eras. For more, visit spotlight.css.edu, St. Scholastica's one-stop shop for arts and lectures information and tickets.